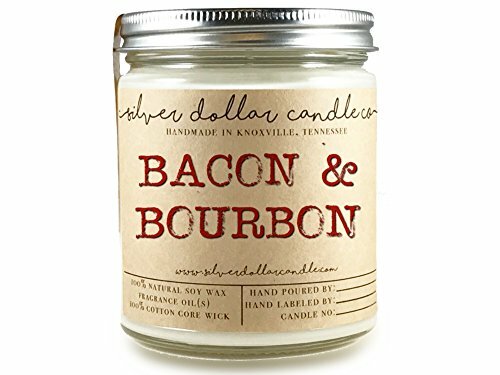 8oz Bacon & Bourbon Man Candle Hand poured 100% Soy Wax Scented Candle by Silver Dollar Candle Co. - Maple, Gifts for Men by Silver Dollar Candle Co. at Nicky's Blog. Hurry! Limited time offer. Offer valid only while supplies last. Perfect Gift for Him! Love Bacon? Know someone who does? Of course you do! This fun scented candle is the perfect gift for bacon lovers everywhere. Perfect Gift for Him! Love Bacon? Know someone who does? Of course you do! This fun scented candle is the perfect gift for bacon lovers everywhere. Maple glazed sweet & smoky Bacon, expertly blended with the warming creamy vanilla aroma of a good Bourbon. Our Bacon Candle is perfect for Christmas, Birthdays, Man Caves, Locker Rooms etc! Poured in 8oz straight edged jars and finished with silver lids. Soy Candles offer a much longer burn time than paraffin based candles, and are perfect for indoors as they burn without smoke or soot! ♦ Soy Wax is considerably more Eco-friendly than paraffin waxes, and supports American Soy Farmers. ♦ We use 100% cotton wicks, providing a consistent, stable, heavy metal free flame. ♦ Soot Free Burning- Cleaner burn than Paraffin based candles. Soy wax burns without creating soot or smoke unlike other waxes. ♦ We use the finest quality fragrance oils, soy wax and wicks. Each candle is hand poured into a glass jar and individually labeled by hand right here in the USA. ♦ Each Candle is made from scratch, by hand, in Knoxville, Tennessee. ♦ Burn time: 16oz: Approx. 80-100+ Hours. 8oz: Approx. 40-50+ Hours. If you have any questions regarding Soy Wax, our candles, or anything about your order, please feel free to send us a message and we'll be thrilled to help you out! Brand: Silver Dollar Candle Co. If you have any questions about this product by Silver Dollar Candle Co., contact us by completing and submitting the form below. If you are looking for a specif part number, please include it with your message.